World traveler wannabe Susan here, reporting in. Last month I spent seventeen days in Spain. I thought I’d share with you a few of my favorite snapshots. 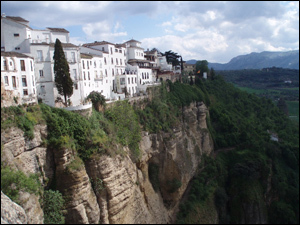 It's hard to choose a favorite place when everything is so amazing, but Ronda was probably mine. This town (below) was awesome in the literal sense of the word. Perched on sheer cliffs of white stone, it overlooks miles of farmland with mountains framing the horizon. I’m a fool for old architecture and statuary. 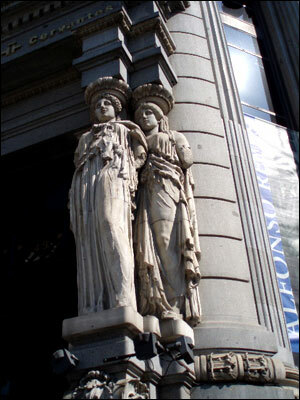 These beauties (below), on a building in Madrid, are just the smallest example of all there was to see. 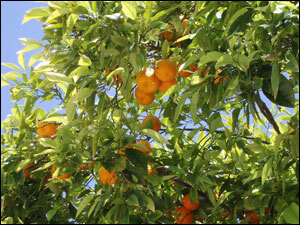 I've bought Valencia oranges all my life. But I had no idea just how good they could be until I actually ate one in Valencia. These were the sweetest, juiciest oranges I've ever tasted. 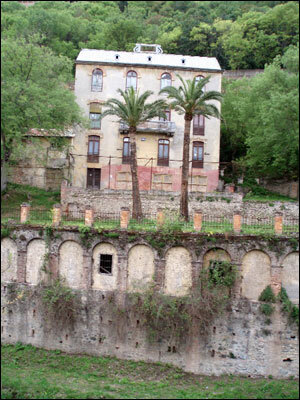 This house that sat above the stream in Granada just knocked my socks off. I think it's my very favorite snapshot, too--and that's saying something, considering I took 337 photos, of which I developed 244 and ended up using maybe 210 for my album, along with bits and pieces of another dozen. The house was just so ancient and interesting and I had to wonder about those underground windows. Is that a big cellar or what? 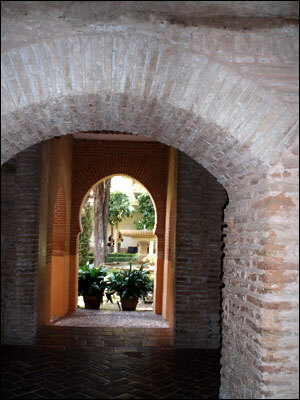 This is a shot into the harem's courtyard at the Alhambra, also in Granada. What a fascinating place! The soul mate and I took around 45 pictures here alone. The Alhambra has such history and is filled with fabulous Moorish mosaics and lacy plaster work and it slays me what fabulous condition most of it is in considering this was a fortified city that was built in the Dark Ages. See more photos below and in the snapshot archives. I must think of the poem FOG ten times a day. And each and every time, I just shake my head, because Carl Sandburg clearly never met my cats. When The Boys, as we call them, get to running throughout the house, Genghis Khan and his thundering hordes have nothing on them. My darling Styx died last spring just a month shy of his 15 th birthday. On June 13 th we brought home two kittens from a barn-born litter. Who knew that a couple of kitty boys could capture our hearts so quickly and fill the gaping hole I believed unfillable? 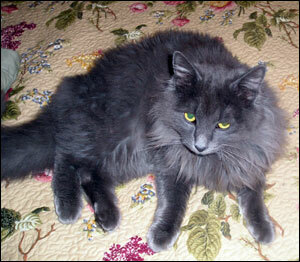 The little gray was only two and a half pounds when we got him, but he was all affection and cocky attitude. We named him Mojo, because he had magic in spades. The black and white tuxedo was nearly twice Mojo's size but was shy and reclusive, so we named him after Boo Radley from my all time favorite book, To Kill A Mockingbird. 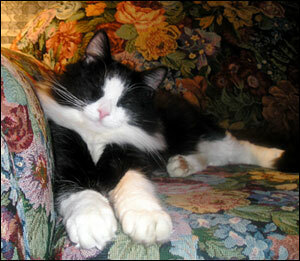 From around corners he would watch us with big solemn eyes, and only rarely could we coax him into our laps. But he liked to be picked up, loved to be stroked and soon began settling as near to us as he could get without actually climbing aboard. It's still uncommon for him to sit on our laps, but he likes to sleep with us and has turned into a regular little lover. He's a head-butter and has a purr like a Kenilworth truck. Mojo has a soft purr and if curiosity truly does kill the cat, that boy's a gonner. Unlike Boo, he spends half his time draped over us. Yet he's not particularly wild about being petted when he's not on our laps and he prefers sleeping out on the wingback chair on the landing. I find those contradictions within each cat fascinating. 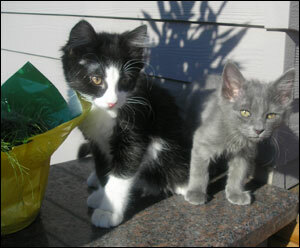 Before adopting Boo & Mojo I'd only owned one cat at a time, and I'll never do that again. I didn't realize how social cats are, and mine spend a lot of time together even though their personalities and interests are more and more dissimilar the older they get. But getting back to my thundering hordes of kitties--frankly I love the noise they make. It reminds me I'm not alone. And trust me, between my work and the soul mate's travel schedule for his work, I spend beaucoup time by myself. So I'm here to tell you: the company and entertainment that the Boo & Mojo show provides me is no small deal. The Triplets are five!! Holy moly, where is the time going? 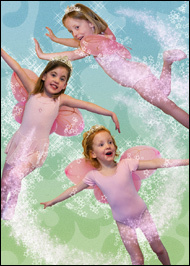 The Fairies: (clockwise from 12 o'clock) Hailey, Caitlin and Sophia. Read the Turf archives and see more photos in the snapshot archives.